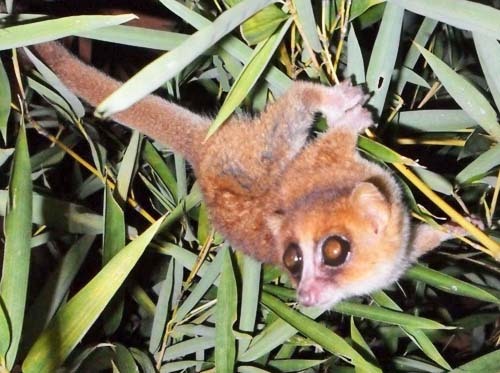 DUKE (US) — Scientists have identified two new species of mouse lemur, the saucer-eyed, teacup-sized primates native to the African island of Madagascar. The new study brings the number of recognized mouse lemur species to 20, making them the most diverse group of lemurs known. But because these shy, nocturnal primates look so much alike, it’s only possible to tell them apart with genetic sequencing. The new mouse lemurs weigh 2.5 to 3 ounces (about 65 to 85 grams) and have grey-brown fur. “You can’t really tell them apart just looking at them through binoculars in the rainforest,” says senior author Peter Kappeler of the German Primate Center in Goettingen. The researchers named one of the new species the Anosy mouse lemur, or Microcebus tanosi. Anosy mouse lemurs are close neighbors with grey mouse lemurs and grey-brown mouse lemurs, but the genetic data indicate they don’t interbreed. “Despite its species’ name, this mouse lemur is threatened by ongoing habitat destruction, and ‘many views’ of its members are unlikely,” the researchers write. The two new species were first captured by co-author Rodin Rasoloarison of the University of Antananarivo in Madagascar during trips to the eastern part of the country in 2003 and 2007. Rasoloarison weighed and measured them and took tiny skin samples for genetic analysis in the lab. Co-authors Anne Yoder and Dave Weisrock, both at Duke University at the time, analyzed two mitochondrial and four nuclear DNA genes to figure out where the animals fit into the lemur family tree. Their genetic analyses were published in 2010, but this is the first time the species have been formally named and described. Funded by a grant from the German Research Foundation, the study is published online in the International Journal of Primatology. During a 2012 return trip to the forest where the Marohita mouse lemur lives, Rasoloarison discovered that much of the lemur’s forest home had been cleared since his first visit in 2003. The state of the lemur’s habitat prompted the International Union for the Conservation of Nature (IUCN) to classify the new species as “endangered” even before it was formally described. “This species is a prime example of the current state of many other lemur species,” Kappeler says. Mouse lemurs have lived in Madagascar for 7 to 10 million years. But since humans arrived on the island some 2,500 years ago, logging and slash and burn agriculture have taken their toll on the forests where these tree-dwelling primates live. Only 10 percent of Madagascar’s original forests remain today, which makes lemurs the most endangered mammals in the world according to the IUCN. “Knowing exactly how many species we have is essential for determining which areas to target for conservation,” Kappeler says. A better understanding of mouse lemur diversity could help humans too. Mouse lemurs are a closer genetic match to humans than mice and rats, the most common lab animals. At least one species—the grey mouse lemur (Microcebus murinus)—develops a neurological disease that is strikingly similar to human Alzheimer’s, so the animals are considered important models for understanding the aging brain. “But before we can say whether a particular genetic variant in mouse lemurs is associated with Alzheimer’s, we need to know whether that variant is specific to all mouse lemurs or just select species,” says Yoder, director of the Lemur Center. “Every new mouse lemur species that we sample in the wild will help researchers put the genetic diversity we see in grey mouse lemurs in a broader context,” she says.